How do some of the most successful businesses manage to inspire their employees, grow their customer base and loyalty, and out-compete others? Two words: trust and inspiration. But how can you cultivate it among your employees? How can you make a customer trust you with their time and money? How can you inspire your employees on the journey that you have embarked on? How can you provide something your competition cannot? These questions can be answered by posing yourself three major questions: why, how, and what. The Golden Circle helps you to answer and visualize these questions. Simon Sinek created this concept to explain how some companies are able to distinguish themselves from many others in the same field. In his book, “Start With Why: How Great Leaders Inspire Everyone to Take Action”, and his TED Talk, Sinek proposes that the reason some companies develop strong and healthy relationships between themselves, their employees, and their customers is because they are purpose-driven. Apple Computers is a great examples Sinek uses to showcase how powerful a why-driven message can be. Sinek’s Golden Circle consists of three concentric circles. The center and core of the Golden Circle is the WHY. It is the most important of the three questions. Why are you doing what you do? What is your purpose? Answering this can be a soul-searching process that might be difficult and time consuming. However, it makes all the difference. Provided with an answer, your company will be an inspiration and will obtain customer loyalty.. The middle circle focuses on the process of HOW you do things. The outer circle asks for the result of the two other questions and asks WHAT you are doing. The Golden Circle is a great strategic tool and amongst other things very helpful for marketing and sales. Many companies know what they are selling, without really knowing the why. The importance of knowing this cannot be understated. Your employees and customers can see what you produce. They can calculate its monetary value and usefulness. What these calculations do not do is drive behavior. People that love what they do and have a purpose are motivators, go-getters and innovators. Their enthusiasm never fails to inspire like-minded people to follow them on their journey and support what they do. When a company or an individual has a purpose, it leaves a unique imprint to what they are producing. It is essential that you know WHY you are doing what you are doing. When you are aware of the reason or reasons for which you want to provide a product or a service, you tap into people’s emotional and rational behavior.They will feel that sticking with you is the right choice for them. On top of that, you and your employees will have a better relationship when you share the same goals, which in turn will bond with your customers. How are you different from the rest? You have answered the why of your actions, your raison d’etre. The next step is to answer the HOW. What are the actions you take to realize the WHY? How are you different than your competitors? How can you create a bond with your customers? Answering this will give you and your enterprise a unique platform on which to stand. This proves essential when people are weighing their options. This sets a course of action with your employees. What do you do that matters? WHAT products or services do you offer? This is the result of answering the WHY. There are many companies that produce cell phones, yet many people only purchase iPhones. Why is that? That is because Apple produces a product that they believe in. They don’t focus on the end result of producing a computer. They have an inspirational message. They challenge the status quo and aim to build better and more user-friendly computer with a beautiful design. By answering WHY, Apple is able to produce a WHAT that sticks out from the rest. 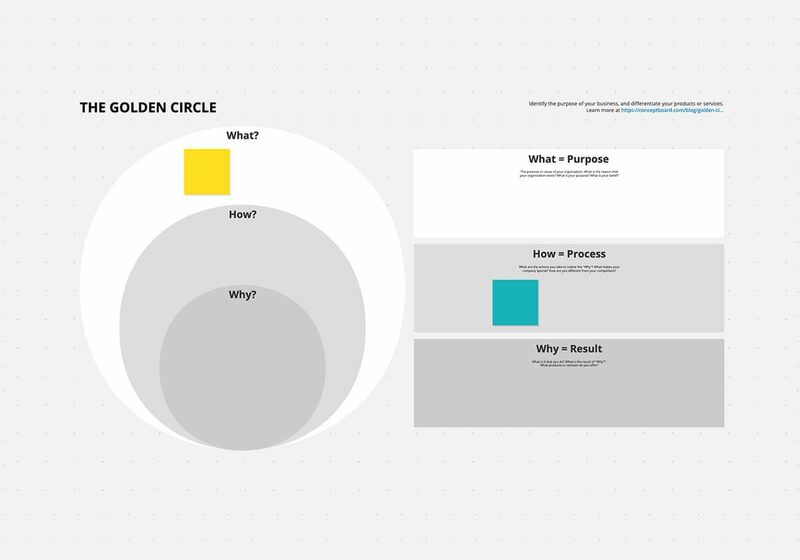 If you are looking for a strategic tool that helps you to find your business purpose and to improve the relationship with your employees and customers, the Golden Circle helps you analyse the WHY of your enterprise. Be an inspiration and build that trust. We’ve made a template of the Golden Circle for you to jump straight right in.